When you get a chance to see a friend in the Navy who’s been deployed and out to sea, you take that chance. And when that chance means a rendezvous in Rome—just a two hour flight away—you take that chance. The Colosseum always impresses… from every angle. The girls and I were out to dinner in the heart of Paris when Mark’s message came in. (I know, I know, you’re not supposed to text during dinner, but I make exceptions for far-flung friends sending unexpected messages that they happen to be on the same continent.) He was going to be in Rome in a week, but just for a day. A quick web search turned up some flight possibilities. The one wrinkle: he wasn’t sure of his schedule—in particular which day he would be free. Hmm. It seems that making sure old seminary friends get their chance to meet up in an ancient European capital isn’t exactly the U.S. Navy’s top priority. So over the next few days we kept the com channels open as best we could—internet access isn’t always possible for those underway on a Navy vessel—to see what his schedule would actually be and what flight would make the most sense for me. Halloween isn’t as a big of a deal here in France as it is the U.S. But the girls did get a week off for the Toussaint break—the “All Saints” vacation. 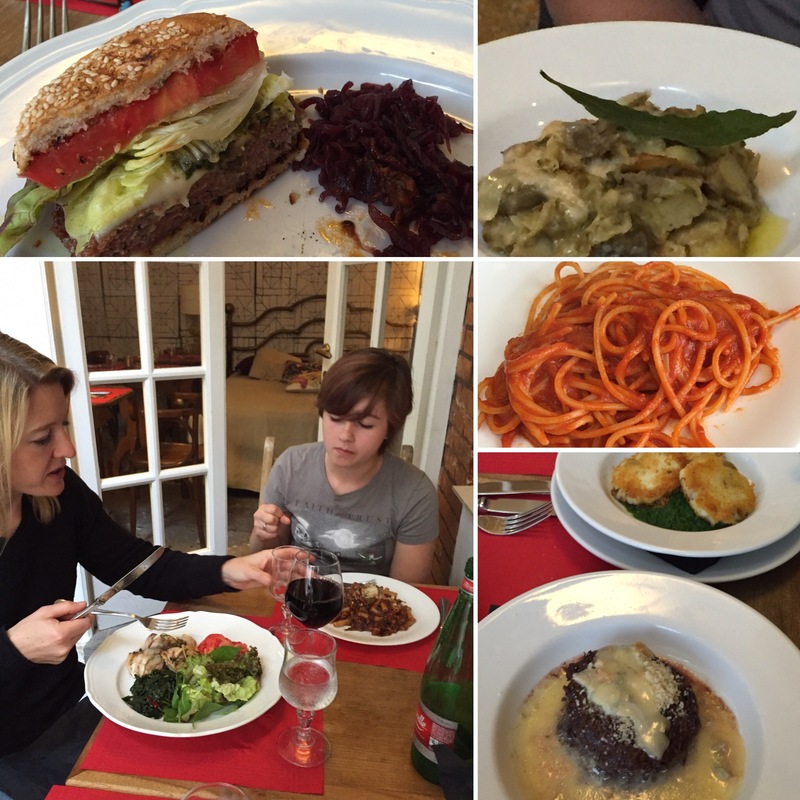 A whole week—and the French schools take two! (The girls are at an international school which follows the French system closely, but not quite exactly.) Do you think this is because the French really want to spend a week (or two) honoring and contemplating the Christian saints? Can I interest you in some oceanfront property in Montana? But we’re no better (Americans, that is). How many of us actually spend that first Monday in September devoting our waking thoughts to the virtues of the common worker and all that labor has done to contribute to “the strength, prosperity, and well-being of the country”? Or do we happily load up the grill with burgers and brats and swig down a beer or six? And then there’s Presidents’ Day. It makes for a nice long weekend to go skiing; how much thought is given Lincoln or Washington, much less Taft or Tyler or Zachary Taylor? Yes, there are parades for MLK and veterans on their days. People fly the flag on Memorial Day and the Fourth of July. Some even genuinely give thanks on Thanksgiving. But holidays (from the Old English word hāligdæg (hālig “holy” + dæg “day”) are by and large valued because they are A Day Off. And maybe in our busy, frenzied world, that’s enough. 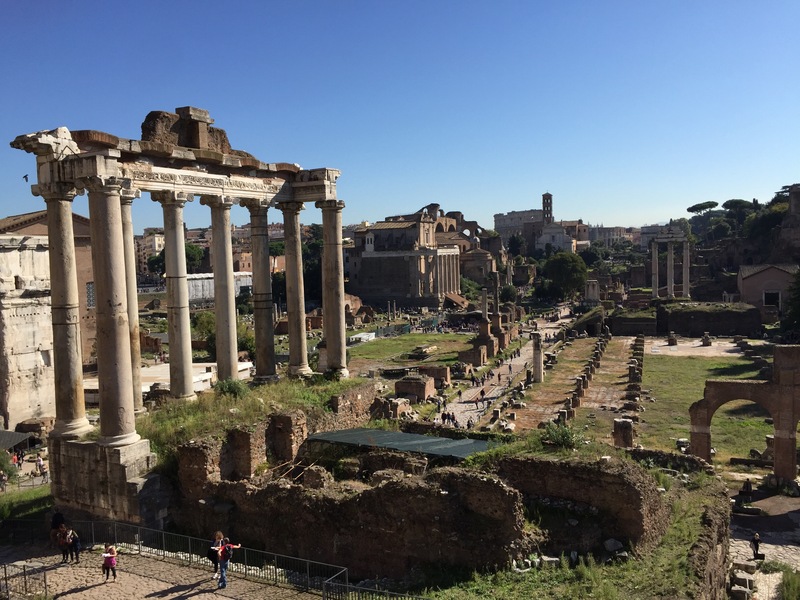 We spent the Toussaint break in the Eternal City, Rome. 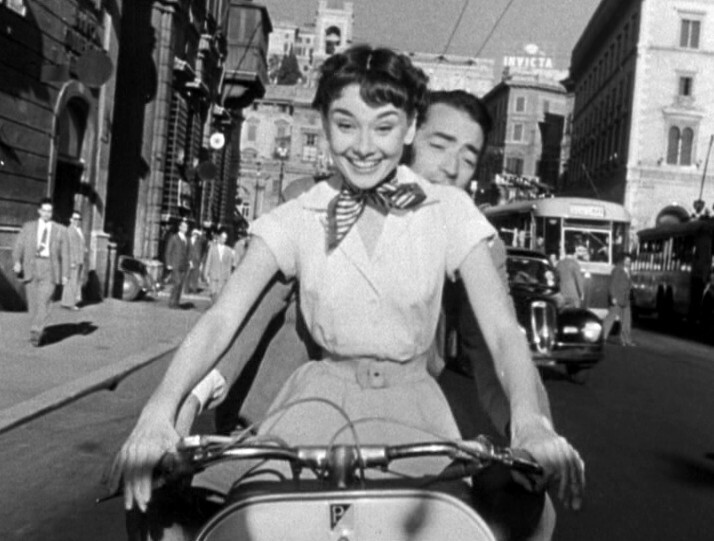 And now I’m ready to watch Roman Holiday all over again. The Pantheon, the Coliseum, the Forum; stunning works by Michelangelo, Caravaggio, Bernini, and Raphael; churches I’d never heard of that would be the pride of any other city but sit in the shadow of St. Peter’s; and the food. Pasta again and again. Pizza. Antipasti. Steak. I could go on, but it’ll just make me hungry. 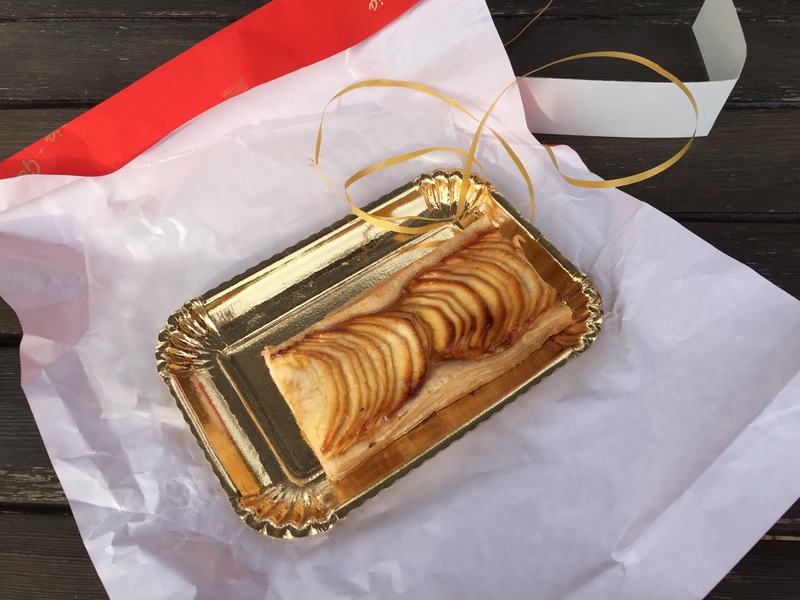 A lovely apple pastry that came wrapped up like a present! A bit of Halloween spirit at Campo de’ fiori. Barriers all around? Construction equipment left in the fountain? And it’s “only for today?” I do not think that means what you think it means. After Rome we took the train to Naples. The conventional wisdom says Italy gets more intense the farther south you go. Intense, meaning more unpredictable, more unreliable, more pickpockets. 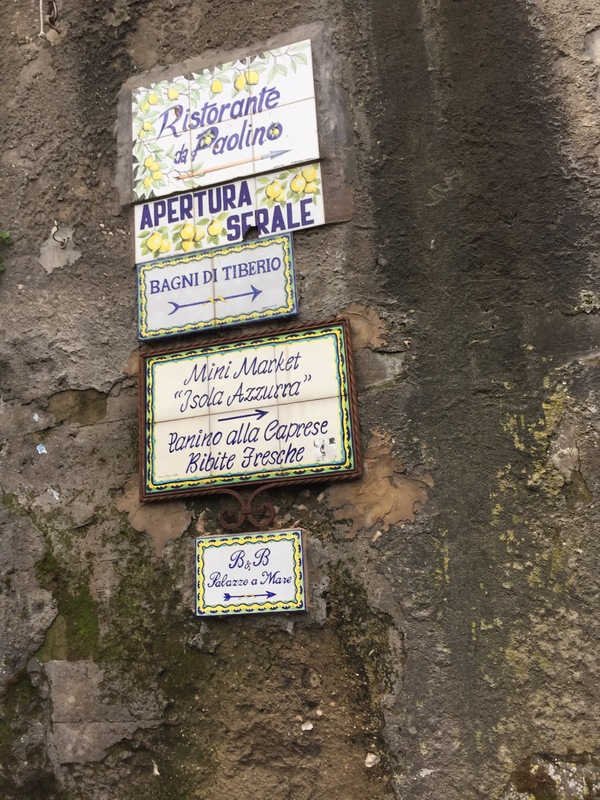 We traced the Spaccanapoli—literally the “Naples splitter”—the ancient east-west street that divides part of the old city. “Street” seems too generous a term; it’s little more than an alley in many stretches. Businesses and markets and stalls spill out into the street, while pedestrians roam, cars inch along and scooters whiz through. We only spent an afternoon in Naples before catching a ferry to Capri. That turned out to be an adventure in itself. You know what an adventure is, right? It’s when things go wrong. Nothing too disastrous, mind you, but we took the wrong tram, only discovering this fact when we were told to get off since it was the end of the line—and nowhere near where we thought we were. We finally caught a bus to get us back to where we belonged. As we were trying to track where we were and not miss our stop, a local helpfully informed us that all of the stops displayed on the bus’s electronic reader board were incorrect! “It’s a guessing game,” she said. We got to our stop at the train station, collected our bags from where we’d left them for the day, found the Information kiosk and confirmed the sailing schedule of our ferry. It’s easy to find, we were assured. Right. But just finding the metro to the waterfront took some doing. It’s a new line, not covered in our guidebook and even some of the locals seemed to be unaware of it. We eventually located it (despite signage that pointed in contradictory directions), and made our way to the water. There will be plenty of signs, we were told. We saw none. The first place we found that looked promising booked passage to much farther destinations. The woman at the counter pointed us across the street. By now it was dark. Our boat would be setting sail in under thirty minutes. We dodged trucks loading onto large boats that clearly weren’t what we were looking for. We asked a dock worker for directions. “The red building,” he said, pointing down a service road parallel to the water. At last, the third red building was indeed the ticket office. And the second counter we checked out actually sold the tickets to where we wanted to go. After all this, I was hoping Capri would be worth the effort. Was it ever! Even with threatening skies that not only shut down the boat tours to the famous Blue Grotto, precluded even the scenic boat rides around the island, and ultimately did much more than threaten, dumping sheeting rain at the end of our one full day there, we had a most memorable time. The island is simply beautiful. The tiny, twisting streets of the old town eventually branch out into walks that lead to various scenic overlooks. 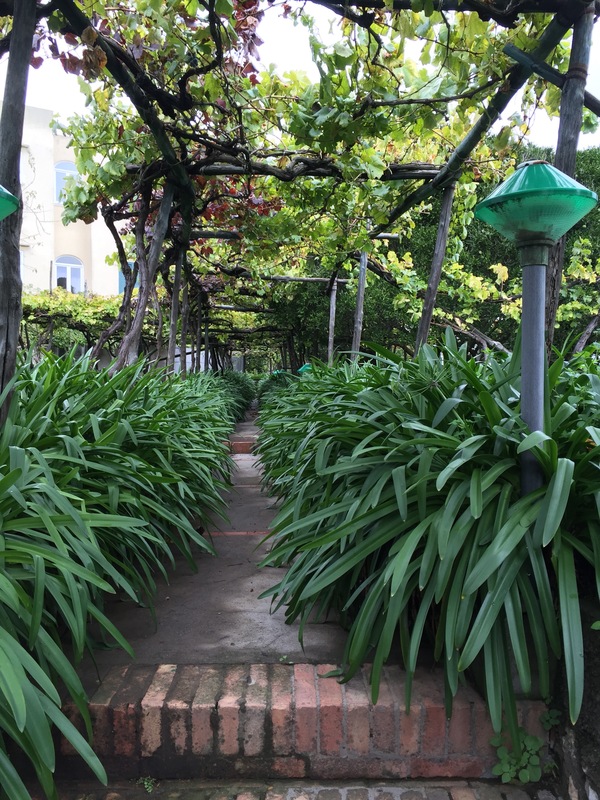 I kept stopping every few yards to take another picture of a glorious vista, a lovely garden, a vine covered walkway, or another one of the countless decorated ceramic tiles that name streets, houses, or even the location of a humble utility line. In our explorations we rambled around the ruins of a villa used by Roman emperors and followed goats that lived there. We took in views of the sea and the white cliffs plunging to the rocks below. Back in the town we found a little restaurant where we could eat outside but still under cover. We were the only ones there. Usually this makes me worried, but the family-run affair turned out to serve up some of the best food we’ve ever had in Europe. The woman who seated us said something about their regular menu not being available and then proceeded to describe the various offerings they had for the day. In her pronounced accent she declared, “We are strange, but the chef is good!” Strange? Maybe a little, but mostly definitely endearing. And the chef delivered. Everything—the artichoke and potato gratin, fried cod balls, radicchio and gorgonzola appetizer, followed by the entrees: swordfish, tuna burger, pastas; and finally the chocolate mousse—everything was delicious. 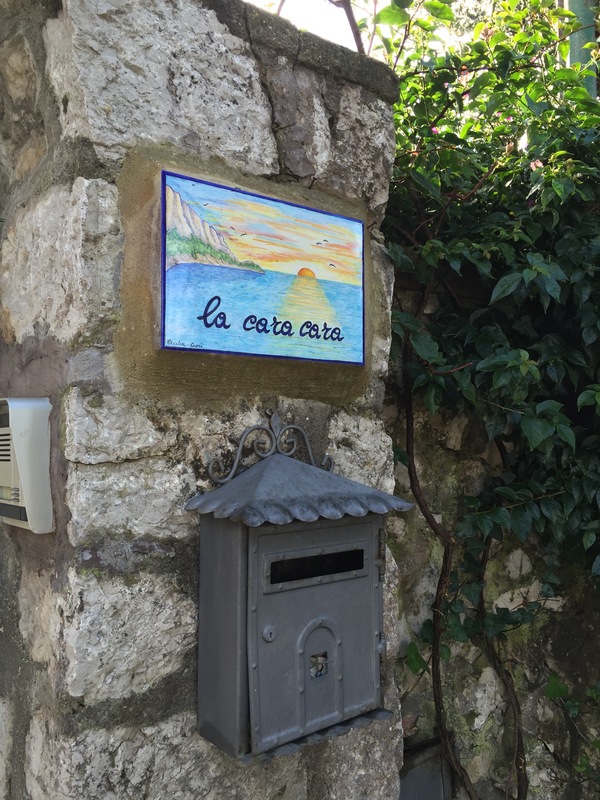 I’d go back to Capri just to track this place down again. Matt Randles on Ready? Break! Martha Gonzalez on Ready? Break!